For the times you need just a little bit more oomph, why not choose our double Snake Bite Earrings? 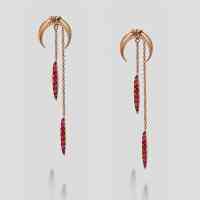 Based on the original Single earring this version has a second shorter stiletto while the original 3.7cm long stiletto remains at the back of the earring creating a layered pair of earrings to take from day to night. The 16 stones hand set will sparkle from day until night!